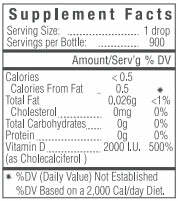 Optimal Vitamin D is a pure and potent liquid vitamin D3 supplement in an olive oil base, providing 2000 IU of cholecalciferol per drop. Most people do not get sufficient vitamin D3 in their diet, and the synthetic vitamin D2 that is added to dairy products is an inferior form of this vital nutrient, and is added in very small amounts. Vitamin D3 occurs naturally in fatty fish, cod liver oil, egg yolks, and beef liver. Optimal Vitamin D contains only cholecalciferol derived from cholesterol in sheep’s wool, making it suitable for vegetarians. Vitamin D deficiency symptoms vary depending on the individual, so consulting with a physician and testing vitamin D levels, as supplementing with too much vitamin D can cause elevated blood calcium levels which can have serious health effects. Measuring 25 hydroxy vitamin D levels is the preferred test for determining vitamin D deficiency; if the level is less than 80, taking a vitamin D3 supplement may be one of the most valuable steps you could take for long-term health. The liquid format of Optimal Vitamin D makes it simple to tailor the dose to fit your specific needs, and is easier to take than capsules, especially for small children. Optimal Vitamin D is free from fillers, flow agents, preservatives, or flavors. Take 1 drop per day or as recommended by your health professional. Do NOT take 1 dropperful a day!